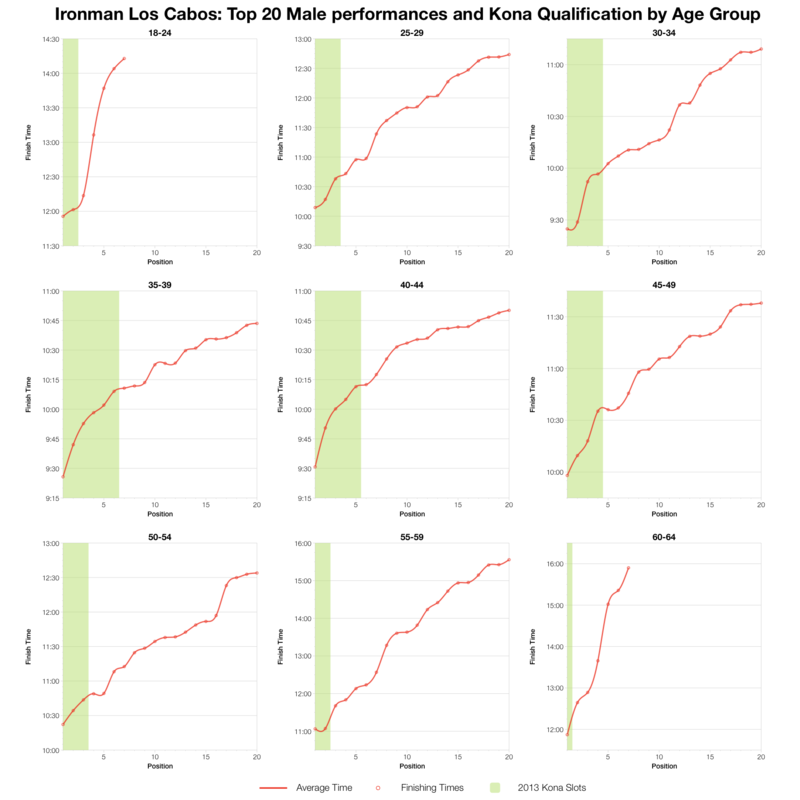 Next up in the Ironman calendar is a relatively new entry, Ironman Los Cabos. 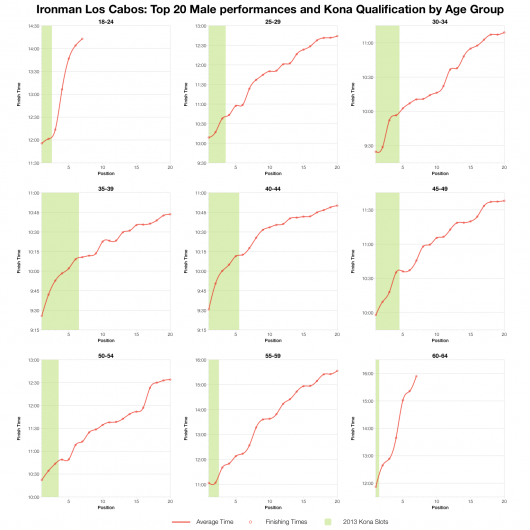 This is only the second outing for Los Cabos meaning limited race statistics that are unlikely to tell us very much. Alongside that the course has been changed, specifically making the bike easier, which will almost certainly ensure faster times in year 2. Despite these limitations I’m still going to run through the stats. 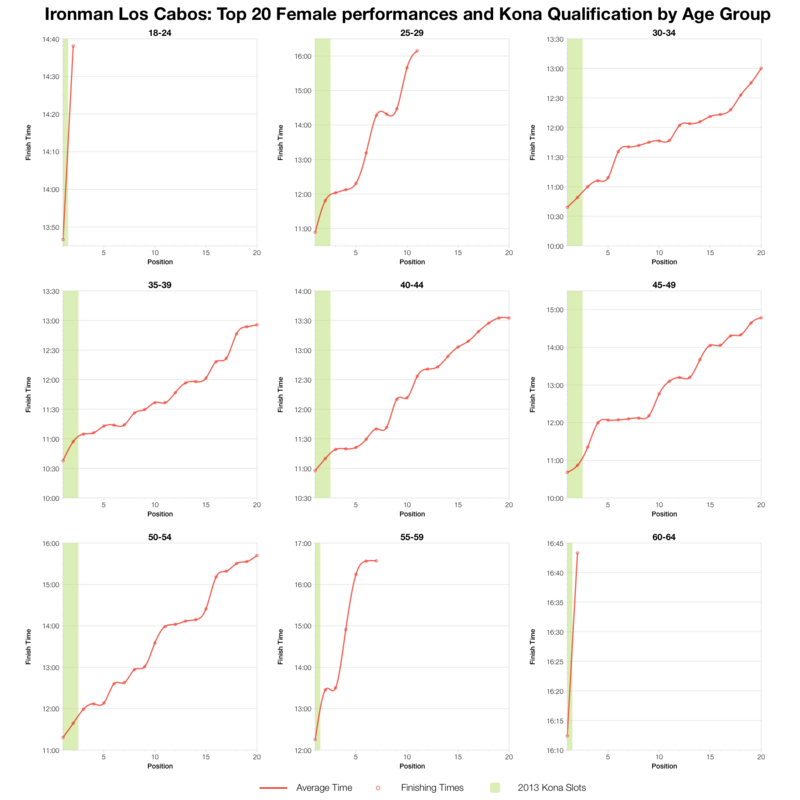 Placing the distribution of finisher splits for Los Cabos besides the overall distribution for 2013 North American Ironman races shows a lot of similarities. The most obvious differences are in bike and run where Los Cabos had a slower bike and a faster run although the margins are small. 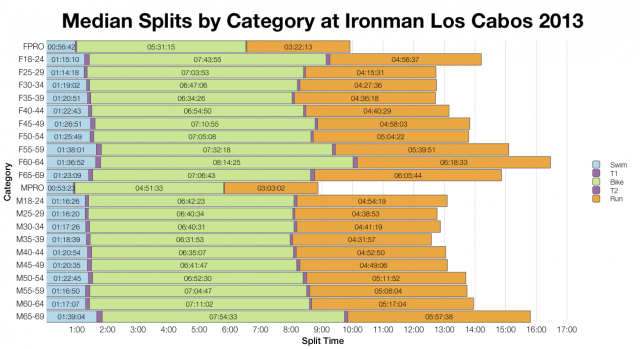 Overall the front of the pack in Los Cabos was slightly faster, but the majority of the field was broadly comparable to other North American races. 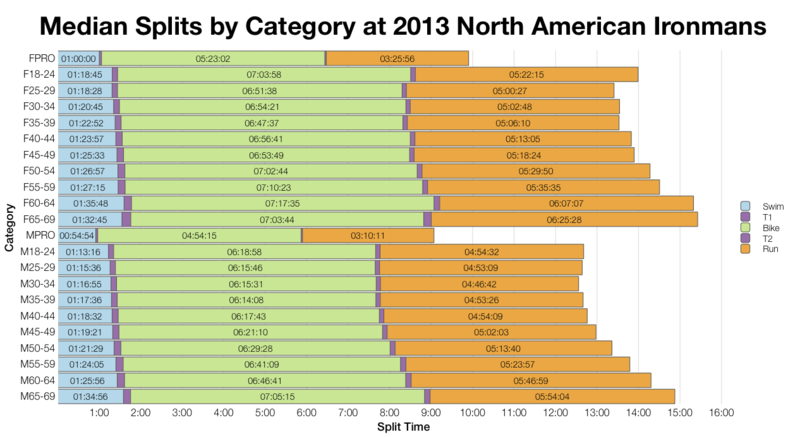 This pattern is supported by the age group median splits above. 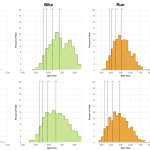 As a general rule, particularly when considering the larger male field, bike times are slower and run times faster. 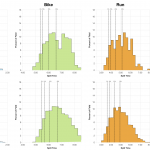 If the changes to the bike course do result in significantly faster bike splits then this will bring the race more in line with the North American averages. 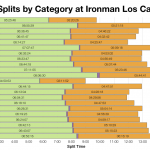 The above table is the provisional slot allocation provided on the Ironman Los Cabos site. There are only 50 slots available at the race so I suspect they have failed to clear a few of the slots for empty age groups. The final allocation will be based on the start numbers on race day so these slots will change. I’ve used the figures provided as a rough guide for allocations. 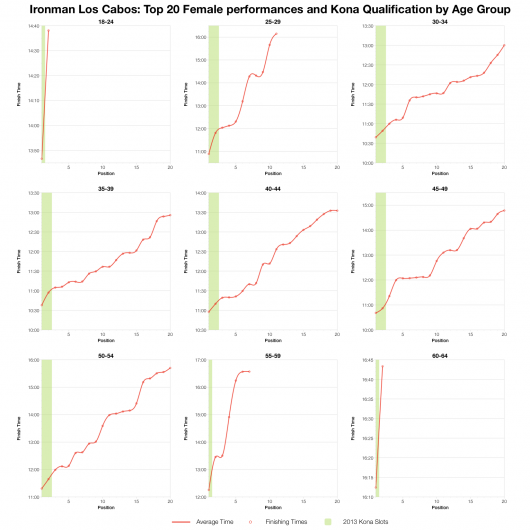 It’s unlikely potential Kona qualifiers can derive any useful information from the top 20 age group times in the chart above. Firstly the course changes should mean qualifying times in 2014 will immediately be much faster and secondly we don’t know if the 2013 result reflect typical conditions for the race. Not that this should make a difference on race day – you either deliver a qualifying performance or you don’t. 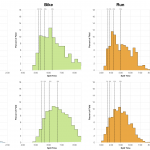 Next week we’ll see if the course changes do deliver faster times and if that impacts the field uniformly or benefits the quicker athletes more. I’d anticipate a faster race overall, but particularly at the front of the field.